Instinctive flow is a sensory based yoga. Thoughtful sequences, anchored in anatomical precision and yogic tradition. Unfolding with an inherent melody, intelligence and sensitivity. Awakening a more conscious approach to living by helping us to apply the awareness of yoga to all the flows and rhythms of life. To bring light upon the beauty of unity and perhaps a little magic, in all we do, beat-by-beat, breath-by-breath. Instinctive Flow harmoniously blends the traditional roots of Hatha, with the fluency of Vinyasa and embodied freedom of Scaravelli. Entrancing and enchanting by delicately weaving a golden thread of Somatics and body-mind connection in every class - a sweet alchemy aiming to develop an authentic transformation and invite meditation through movement. Ground - Feel, Sense & Discover. Awakening the roots of the body-mind, the breath and opening the door to grace and flow. Connect - Embody, Unfold & Explore. from an inherent rhythm of breath, somatics & freedom we come home, to the Self and to each other. Play - Creative, Curious & Motivating flows. Escaping into our cadence to release & challenge. Constantly reinforcing and evolving, experientially. Inspire - Unify & Integrate, giving rise to Illuminate. Expanding our awareness to the limitless possibilities, body, mind & spirit. Drawing on almost 20 years worth of experience, Leanna's dedication to what she does means that she is continuously learning, working closely with her inspirational mentors. Currently she's gaining guidance and inspiration from the profoundly wise John Stirk, author and body-mind teacher. Her practice and teaching are also strongly influenced by the great work of Bonnie Bainbridge Cohen, Emilie Conrad, Diane Long, Cass Phelps, Sally Kempton, David Keil’s Yoga Anatomy and Gary Carter. Combining the wealth of knowledge and skills she gains from these collaborations, Leanna shapes her classes to be anchored yet playful, steering others (experientially) to their birthright of pure joy and creativity, while strengthening meaningful relationships to inner and outer development on physical and energetic levels. Most recently Leanna became a certified ThetaHealing®Practitioner. After responding to a calling to move into energy work, she now actively explores the great healing gifts and energy shifts within her life, her family, friends, work, students, groups and 1-1’s. Contact for more information and private sessions. Leanna took her first yoga class in 1998 and was instantly entranced by the power of practice.. So much more than a simple fad or phase, for her, it was an innate sense of finding home. Yoga quickly became the central point and the one constant in a whirlwind life. 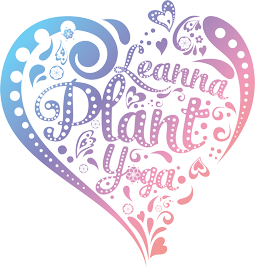 After years of personal practice, and encouragement from her teacher Leanna undertook an intense 200 hour Hatha Teacher Training Course with Yoga Haven whilst pregnant with her second child. During motherhood she trained in Pregnancy Yoga and also embarked on a course ´Yoga For The Special Child´ with Jo Manuel. This allowed her to work closely with special needs children, enabling her to experience the therapeutic benefits which can result from ‘subtle’ yoga and the healing influence we have through the Mind-Body Connection. Leanna relocated to the magical island of Ibiza in 2012, where she undertook an advanced 500 hour Teacher Training course. Although Leanna teaches all over, Ibiza is where you will find her roots and her heart with her 3 babies and her husband; learning, playing, teaching, living, loving. A sequence of events led to the most defining moment of Leanna’s yogic life; an illness which left her frequently having seizures and in bed for many months. This difficult time further only served to deepen her yogic principles and inner development. Unable to complete her usual practice she stumbled across the methods of Vanda Scaravelli and soon completed a Scaravelli course with Catherine Annis, which left her able and open to alchemise Vanda’s non-linear ethos and elements in her own yoga flows. As well as helping her to heal and reintergrate, Vanda ignited her true, authentic path. Scaravelli Yoga - so captivatingly graceful, deeply relaxing yet deeply strengthening. Connecting to gravity, the spine and breath. Inviting the body to let go, a sense of undoing while bringing up lightness and freedom, just like flowers rooting down to grow up to the sun. Vanda’s style is not easy, in fact a tremendous amount of effort is required to shift old patterns and tension. Being passive yet alert and attentive is hard work but so liberating and beautiful. It’s movement beyond words, a journey within and through an ever-evolving practice; contracting, expanding, breathing, feeling and ultimately restoring a natural intelligence within us all. It is with my deepest gratitude that I bow my head with humility to all my teacher’s past, present and future, in all their forms. As well as my biggest teachers - my 3 babies and my husband. Thank you for shining so much light in my life and upon my true path.. as a woman, a mother, a student and as a teacher, thank you.